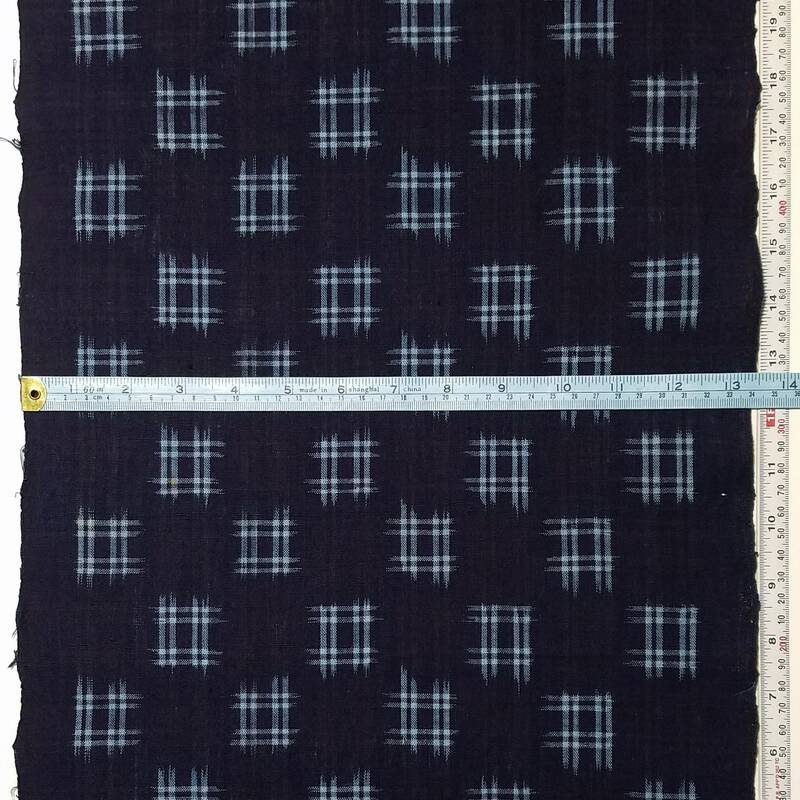 This listing is for one piece of kasuri (Ikat) fabric. The photos show the actual section of fabric available for purchase. This is a vintage item however it is in excellent condition. This section of fabric does have some flaws. Please read the description carefully to learn about these flaws. 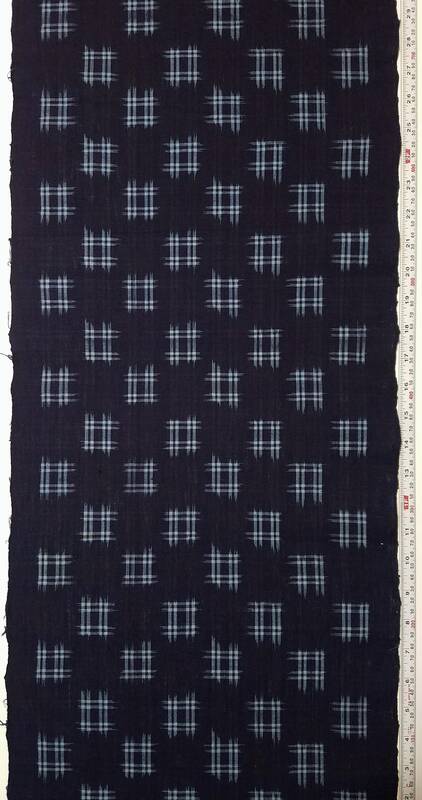 This cloth is about 51 inches x 13.5 inches ( 129.5 cm x 34.3 cm) in size. 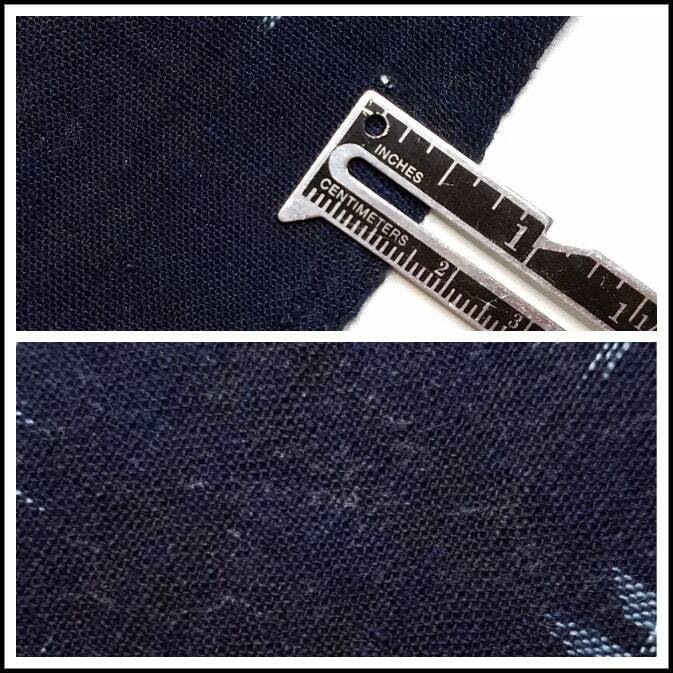 2 small pin holes are seen in the fabric. One of these holes can be seen in the top photo of the 8th picture. These pin-holes are near the selvage line. There are some flaws in the weaving (photo 9). These flaws and pin holes do not extend more than .5 inches (1.3 cm) past the selvage line and should not affect how the fabric can be used. Some areas of fabric also appear to be lighter. I believe that this is caused by starch residue and/or burnishing of the fabric. A close-up photo of this can be seen in the bottom photo of the 8th picture. These areas are only present on one side of the fabric but they are extensive on that side. Kasuri is perfect for boro projects, doll clothing, accent pillows,quilting, hair accessories, bags or clothing. Please remember that Japanese yukata fabric is not as wide as other fabrics. Kasuri, also called Ikat, is created by weaving together threads that have been pre-dyed with a pattern. The threads are then woven together and the pattern will be shown in the fabric. 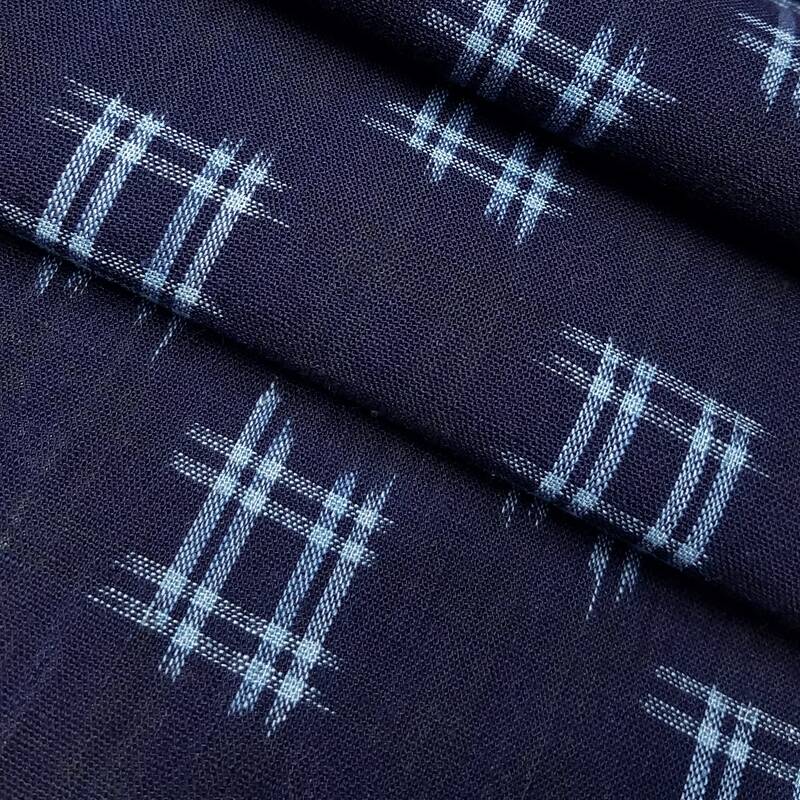 This fabric is "tateyokogasuri" kasuri as it uses both warp and weft threads that have been dyed to create the pattern. 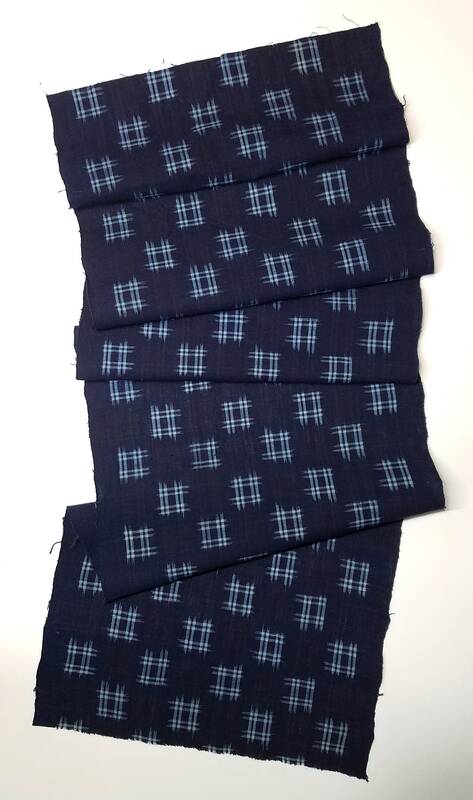 The cotton fabric has a deep indigo blue background. 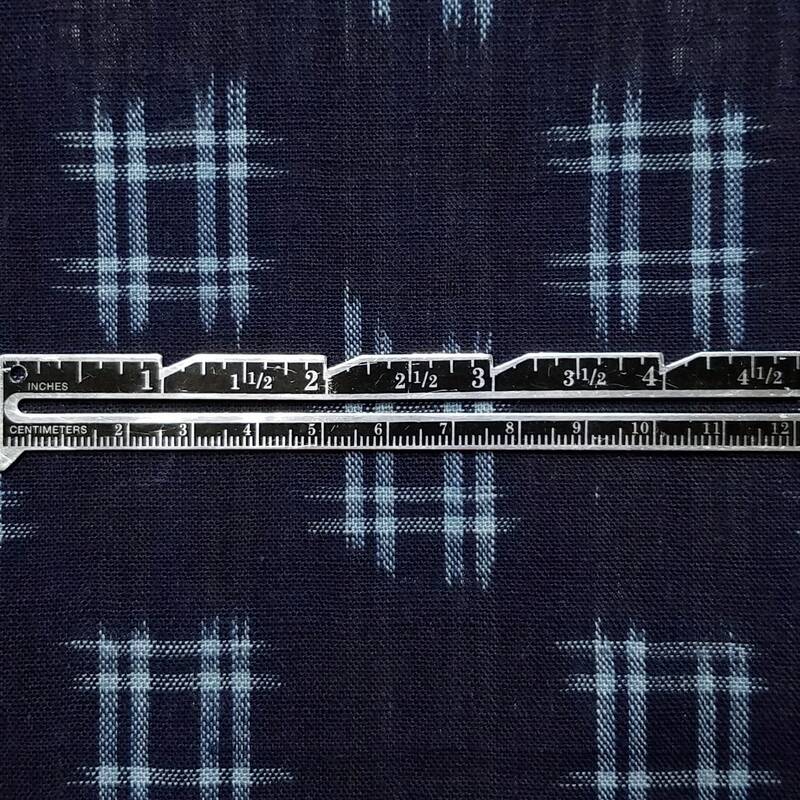 A cross-hatch, woven design was created in the fabric in deep brown-black and light blue colors. The dark cross-hatch design is very difficult to see. It is most noticeable in the 7th photograph. Please note that the brown-orange spot in this photograph is where the thread was not dyed correctly and is not an age spot that can be washed out. Please refer to the last photo for the best representation of the colors. 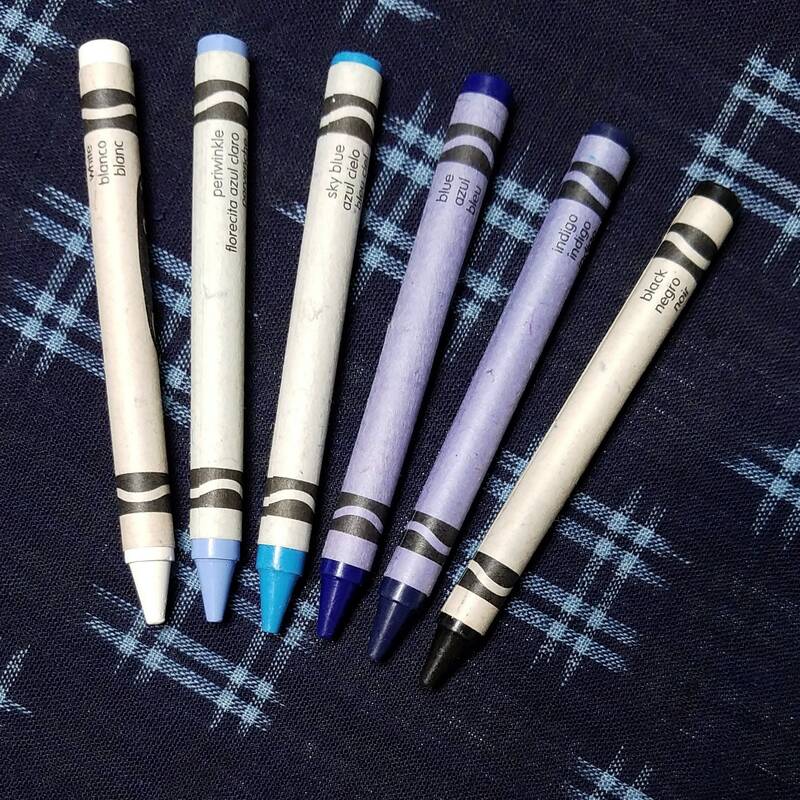 Crayola brand crayons are shown in the photo for a color comparison. 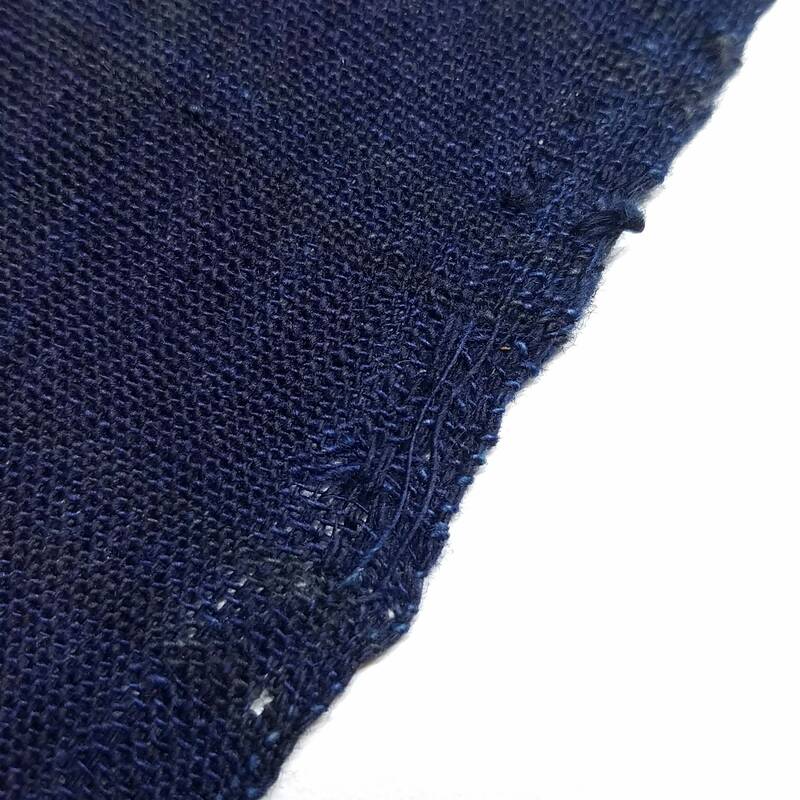 I believe that this is a natural-indigo dyed fabric. 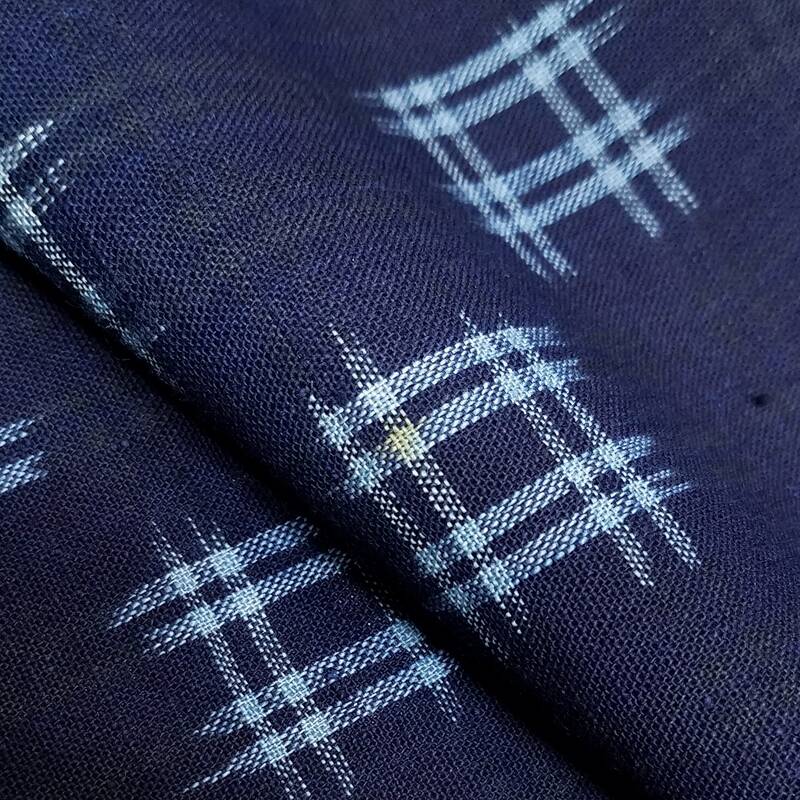 This fabric has a crisp drape and slightly open weave. The white of my photographing surface can be seen through some of the weave. The fabric is not sheer but light can be seen through it when held up. This can also be seen in the 5th photo. -primarily cotton. 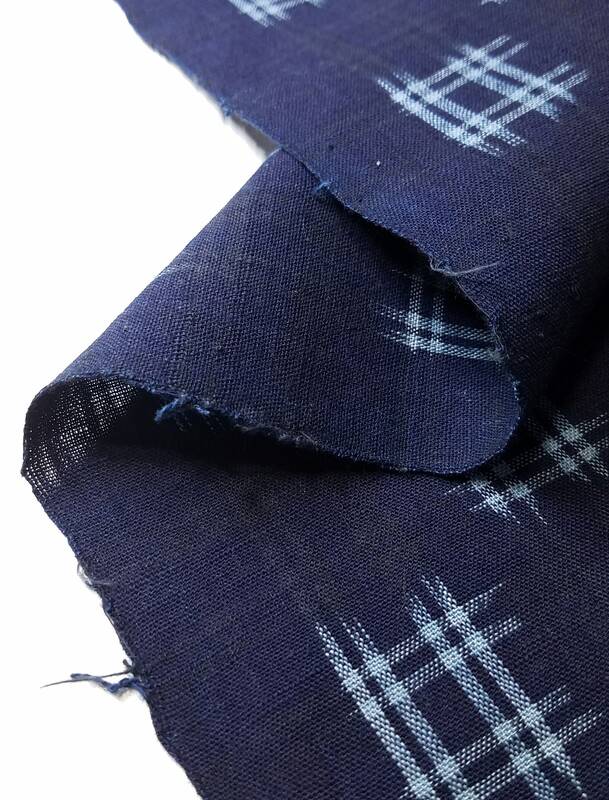 This fabric could also contain other natural fibers such as hemp or flax. I believe that the pictures show a good representation of the fabric colors however, please remember that colors may look different on your monitor. This is a vintage item so there may be small blemishes or marks in addition to those noted in the description. This item has been stored for many years so there may be a slight storage smell although I do not notice any.